The original swimrun competitors carried backpacks of dry socks and food and other supplies. Today companies are making special gear for the runners/swimmers. CASCO BAY, Maine — Once the thick veil of fog lifted, a horn sounded and hundreds of athletes wearing running shoes and wetsuits leapt into Casco Bay and began swimming — hard. Their goal: To swim from one island to the next, scrambling out to run across each island where they would dash along singletrack trails, follow paved roads by summer cottages, bushwack through thick brush, or slog their way through sand or across scree-covered terrain. They moved in pairs, often tethered together with a thin bungee cord. All told, they would swim 4 miles and run 10 miles as they connected nine islands in Casco Bay. Welcome to the new sport of swimrun. Last summer, 240 athletes participated in the Casco Bay Islands Swimrun, the first event of its kind in the United States. Competitors swam anywhere from 270 to 1,700 yards between islands, and ran between half a mile to just over 4 miles across islands. The sport attracts competitive swimmers, runners, adventure racers, triathletes, and people drawn to its unpredictability. Sign up for a running race or a triathlon and you cover exact distances and precisely defined routes. With swimrun, athletes swim their best lines from island to island — there are no buoys marking the way — and take currents and conditions into effect so they don’t drift off course and add mileage. On land, racers follow a running course that’s marked with flagging tape where possible, or they use their best judgment and a map and compass to make their way over the terrain. In fact, an appreciation for nature and the beauty of the landscape lies at the philosophical heart of this sport. The idea for swimrun traces back to a drunken night among friends at a seaside resort in Utö Värdshus, Sweden. As the story goes, four guys walked into a bar and, many drinks later, came up with the brilliant idea of racing each other from one end of the Stockholm archipelago to the other — a distance of 75 kilometers (about 46 miles) — with the losing team having to cover dinner, drinks, and the hotel for the losers. Only two teams showed upon race day, wearing surf wetsuits and old sneakers, and carrying backpacks with sleeping bags and other supplies. It took them 23 hours to complete the distance, including a stop to sleep under a tree. Andersson and his cohorts soon met Michael Lemmel and Mats Skott, adventure racers and organizers who agreed to help put together an official swimrun race. They mapped out the course and staged the first race in 2006. This time, 10 teams showed up, but only two finished. Some still towed dry bags with socks, shoes, and a towel. 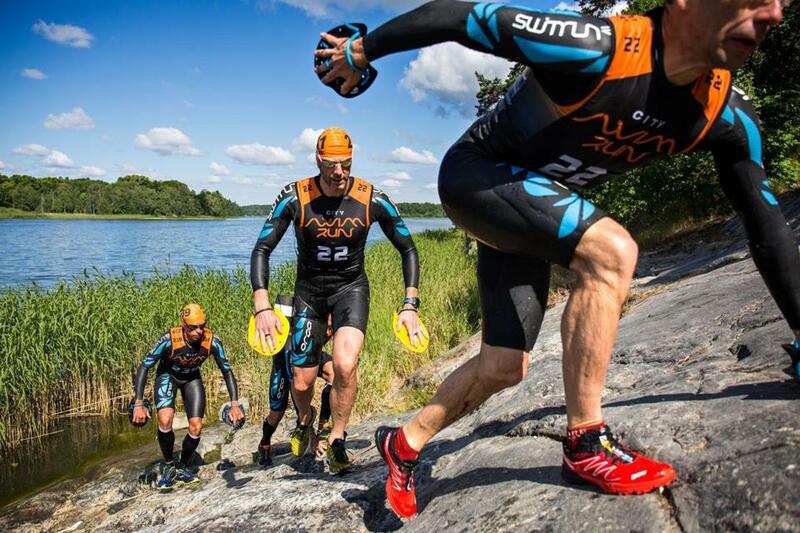 The idea took off, though, and by 2012, Lemmel and Skott organized three swimrun races in Sweden, and had to turn away 400 teams (max participation in each race is 120 teams for safety reasons and to minimize environmental impact). That year, one of the racers coined the name Ötillö, meaning “island to island” in Swedish. Now, in 2017, more than 400 swimrun races exist worldwide, including Switzerland, Spain, South Africa, New Zealand, Croatia, and Thailand. The original Ötillö event serves as the world series for swimrun, with participants from 35 countries. In August 2016, native Mainer Jeff Cole and Finanger, a pro triathlete and adventure racer, launched the Casco Bay Islands Swimrun. “We knew we were on to something,” says Finanger. “We opened the lottery and had more than 600 applications for 100 spots.” This year, more than a dozen swimrun races will take place across the country, in California, North Carolina, Georgia, New Jersey, and Washington. One of the biggest challenges for many, however, is having a partner. Racers compete in the men’s, women’s, or mixed division. Each team has two people, and those two racers must stay within 10 meters (30 feet) of each other throughout the swim and 100 meters during each run. Another aspect that’s evolved in recent years is the gear, or lack thereof. The challenge is to minimize what you take, and make everything count. During the early races in Sweden, racers towed dry bags stuffed with backpacks, extra clothes, sleeping bags, and food. One team brought a vacuum-packed steak dinner. “It was like the Victorian days — bring everything with you and we’ll set up camp,” says David Thompson of St. Paul, Minn.
Today, racers bring only what’s necessary, and can choose from specialized gear created for swimrun athletes. Gone are the days of surf wetsuits and old sneakers with holes drilled in the soles for drainage. Companies such as Orca now make swimrun-specific wetsuits that have flexible neoprene material, pockets for stashing energy food, a built-in whistle, and front zippers and removable sleeves for cooling off on runs. Icebug, a Swedish company known for its high-traction winter and orienteering shoes, makes a trail-meets-track shoe with super grippy soles that help racers scramble up slippery rocks and navigate wilderness terrain. These lightweight shoes drain quickly and have lightweight EVA foam that helps them float while racers swim. Many athletes use swim paddles for extra propulsion and swim buoys to help keep their legs afloat, and some even bring fins. All racers must have a waterproof pressure bandage, an inflatable safety float with a GPS, a compass, and a map. Racers must also finish the race with every piece of equipment and energy wrapper they start with: If you bring swimming fins and decide you don’t need them, you still have to carry them to the finish — no stashing them under a bush to retrieve later. Many athletes also attach a tether — typically a thin bungee — between them, especially during the swim. “It was tricky using it, but it gave me peace of mind that we weren’t going to wander too far apart,” says Stevens.